in the equipped Thalasso Spa centre. The Hotel is suggested for singles, couples and for families with children. 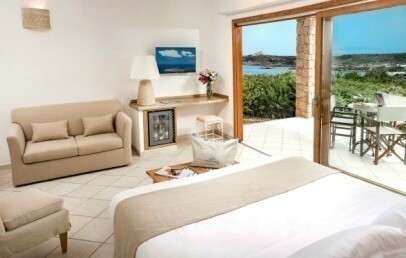 The Marinedda Hotel Thalasso & Spa is very close to Isola Rossa (Gulf of Asinara, North Sardinia). Isola Rossa is a fishing village, characterized by red granite and an ancient but romantic Aragonese atmosphere. Closer to the Marinedda Beach, the location of the Hotel is perfect for a sea holiday in Sardinia: 40 minutes from the Santa Teresa and Porto Torres ports and 60 minutes for the Olbia and Alghero Airports. Elegant and refined, the Marinedda Hotel Thalasso & Spa is one of the masterpieces of the Delphina Hotels & Resorts. 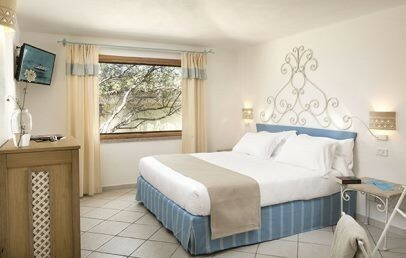 The Delphina hotels chain is suited to couples, single and families because of its unique position and its several services. It consists of 2 swimming pool, panoramic Restaurants, welcoming bars and the renowned Thalasso & Spa Centre. Among the facilities, there is a professional child assistance (during set periods) and evening random representations and live music. The Marinedda Hotel Thalasso & Spa has 195 rooms, located both on the ground and first floor. All room typologies are fully equipped and refined with the colours and details of the typical Mediterranean style such as the chestnut timbers and verandas covered with local stone. Each room has an equipped balcony/patio (2 deck-chairs or 2 chairs with table), bathroom with shower, hairdryer, bathrobes for adults, beach towels; air conditioning, TV, safe and minibar. The Wi-Fi connection is available in every room. Classic – double bed (twin beds on request), possibility to add a child bed or baby bed up to 11 years. Single room – room with a queen-size bed. Relax – double bed + sofa bed or inbuilt sofa bed for a child up to 11 years. Junior Suite – refined room with double bed with sitting area with one sofa bed for a child up to 13 years old. Suite – prestigious room with double bed + separate living room with two sofa beds or inbuilt sofa beds for children/teens up to 13 years. Possibility to add a baby cot (on request). 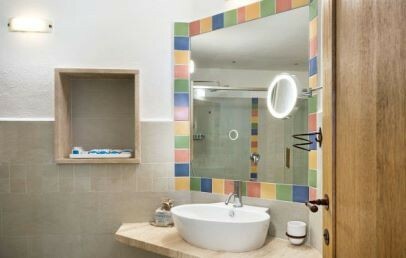 Family Suite – are two Classic rooms with connecting door for 4 people. President Sea View – luxurious room with double bed and lounge area with two single sofa beds, for children/teens up to 13 years old. Nice veranda with 180 degrees view over the bay. Free access to the Thalasso Centre, reservation required, with use of Thalasso pools, Turkish bath, sauna, cardio-fitness and relaxing zone. Executive Elicriso Sea View – perfect for an exclusive stay for couples, looking for romantic and private moments. 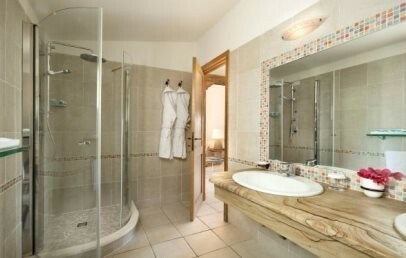 Private terrace with small pool with heated sea water with whirlpool (depth 1,30 m). Double room with living area. Free access to the Thalasso Centre, reservation required, with use of Thalasso pools, Turkish bath, sauna, cardio-fitness and relaxing zone. Marinedda beach is located at a walking distance (300-500 m) from the rooms. The beach is equipped with umbrellas and sunbeds. Guests can rent them for an additional charge in the reserved area for the hotel guests, starting from € 20 per day, € 25 per day for the 1st row (subject to change and availability). Discovering the area you may reach amazing bays with crystal clear water nestled in the typical red rock. By car or by boat is possible explore the whole area such as Badesi beach, one of the most wild seaside of Sardinia. The "Elicriso" Thalasso & Spa Center covers an area of 2500 sq.m. and is holistically dedicated to thalassotherapy, with an inviting atmosphere to allow undisturbed moments of absolute tranquility and to be pampered by various spa treatments. Access to the wellness centre: € 30,00 per person (half day): free use of the Thalasso pools, Turkish bath, sauna, gym and relax area. Guests staying in the President Suite Sea View and Executive Elicriso Sea View have free access to the Thalasso Centre, reservation required, with use of Thalasso pools, Turkish bath, sauna, cardio-fitness and relaxing zone. PS: A self-certification of "good health" is required, to complete on-site, before attending any kind of treatments and for use all facilities. Special treatments for pregnant ladies available, excluding not indicated treatments. Access to minors not allowed; from 14 years allowed accompanied by parents or with a written consent signed by them. The wellness centre is open 6 days a week. Upon booking you may request our assistants for further information about the available treatments. It will be our pleasure to advice and book for you the best treatment that will complete your wellness holiday. The Mini and Junior Club is active from 19.05. to 13.09. with assistance for children aged 3 to 12 years (not completed), 6 days a week from 09:30 to 13:00 and from 15:30 to 18:30. Moreover they organise group activities of soccer, tennis, mini basketball, archery. The babysitter is on request and subject to charges. Hotel Marinedda offers the half board formula with breakfast and dinner. The breakfast buffet is served from 7:30 until 10:30. Dinner is served from 19:30 pm to 21:30 pm (from 20:00-22:00 at the restaurant "Tramonto"). In the main restaurant "Petra Ruja", spread over two floors overlooking the bay, in buffet style with Mediterranean and local cuisine or two panoramic restaurant with table service and by candlelight: "Punta Canneddi" (table reservation required, no extra charge) and "Tramonto" with tasting menu (table reservation required, with supplement, children over 6 years welcome). Moreover a pizzeria "Basaricò" with a selection of different pizzas prepared in the wood oven, appetizers, ice cream. Guests in half board might swop their dinner with the Mediterranean Brunch®. For lunch are available the Brunch Mediterraneo® with light buffet cuisine from 12.30-14:00: tasty hot pasta plates, cold dishes, vegetables and legumes, salads, cheese and fruit. There are no classic courses with meat and fish and desserts. Price: € 28,00 per person/day. Snack bar "Horizonte" by the pool or in the "Baretto" on the beach with snacks. 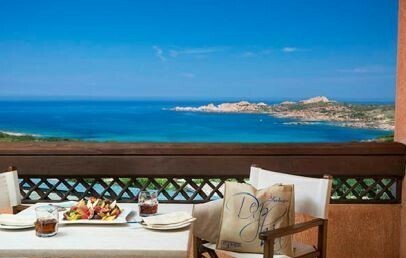 If guests book the brunch for the entire stay, they can take advantage of the Brunch Around in one of the 4/5 star hotels of this same hotel group, during the various excursions in the Gallura region. On request and with prior reservation are gluten and dairy free dishes. The opening and closing of the restaurants and bars are at the discretion of the Management. Reception is open 24 hours a day. Free Wi-Fi is available free of charge in the rooms, at the reception, in the bars, in the swimming pools and on the beach. At guests' disposal are two swimming pools, one of each is a water-sea-pool, tennis fields, 5-a-side football field, mini basket, archery, gym, trekking paths. Shuttle service to Isola Rossa free of charge with set timetable. Strollers rental free of charge (reservation required by booking). Parking covered, not guarded, free of charge. With extra charge are available several water sport activities on the beach, boot excursions or any land excursions. An amusement water park "Aquafantasy" is about 1 km away (external service). PS: payments at the hotel have to be made by a special prepaid card issued at the reception. The left amount will be refunded at the check-out. Double room furnished in a modern typical Mediterranean style. 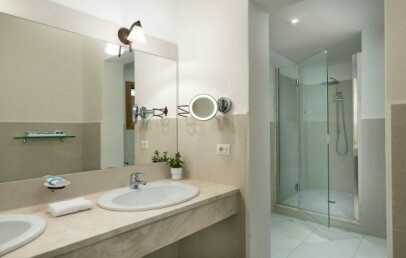 The bathroom has shower, hairdryer, beach towels, bathrobes for adults. All Classic rooms have a garden view veranda equipped with two deckchairs (or two chairs and a table). Single room furnished in a modern typical Mediterranean style. The bathroom has a shower, hairdryer, beach towels, bathrobe. All rooms have a garden view veranda, equipped with two deckchairs (or two chairs and a table). Double room furnished in a modern typical Mediterranean style. The bathroom has shower, hairdryer, beach towels, bathrobes for adults. All Classic rooms have veranda equipped with two deckchairs (or two chairs and a table) with sea view. Single room furnished in a modern typical Mediterranean style. The bathroom has a shower, hairdryer, beach towels, bathrobe. All rooms have a partial sea view veranda, equipped with two deckchairs (or two chairs and a table). Double room furnished in a modern typical Mediterranean style. The bathroom has shower, hairdryer, beach towels, bathrobes for adults. All Relax rooms have a veranda with two deckchairs (or two chairs and a table). Double room furnished in a modern typical Mediterranean style. The bathroom has shower, hairdryer, beach towels, bathrobes for adults. All Relax rooms have a veranda with sea view and equipped two deckchairs (or two chairs and a table). 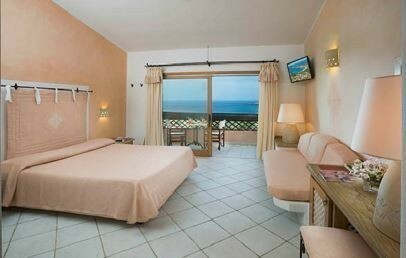 Spacious Suite furnished in modern typical Mediterranean style, with bedroom and separate living room with sofa beds. The bathroom has shower, hairdryer, beach towels, bathrobes for adults. The Suites have a nice veranda equipped with two deckchairs (or two chairs and a table). 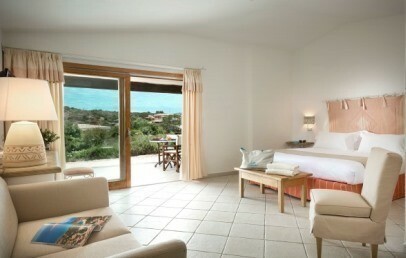 Spacious Suite furnished in modern typical Mediterranean style, with bedroom and separate living room with sofa beds. The bathroom has shower, hairdryer, beach towels, bathrobes for adults. 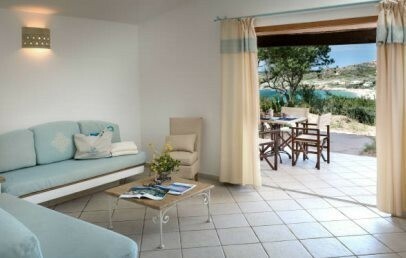 The Suites have a nice veranda with sea view and are equipped with two deckchairs (or two chairs and a table). Long Stay - 5% reduction for minimun stays of 14 nights! FREE ENTRY TO THE WELLNESS CENTER: for adults in President or Executive Elicriso room, free use of the thalasso pools, Turkish bath, sauna, cardio-fitness and zone relax (reservation required).